Cross the bridges over the Fountain Pool into Jungle Island and enter a world of striking blooms and lush foliage, demonstrating how a garden of exotic interest can be created using striking specimens from around the world. The garden uses bold, ‘architectural’ plants to create a fantasy of exciting contrasts – thrusting spikes (Phormium / Cordylines) and fronds (Ferns) alongside tall, feathery grasses (Miscanthus) and outrageously vibrant colours (Cannas / Lilies) against a backdrop of deepest green. As you walk through the ‘jungle’ be inspired by the colourful flowers, including parrot Tulips, Red Hot Pokers and Gladiolus. The decking encloses a bog garden featuring the giant rhubarb-like leaves of Gunnera manicata and other moisture-loving plants such as Rodgersia and Ligularia. Enjoy the Fern area, which includes the giant Tree Fern (Dicksonia antarctica), and catch a glimpse of the water beyond. Charlie Dimmock is one of Britain’s best known and best loved gardeners, specialising in water features. Charlie first came to the nation’s attention on BBC1’s incredibly successful Ground Force. In 2001 Charlie’s appeal spread to America and she now contributes regular gardening strands to the American broadcaster CBS for The Early Show. 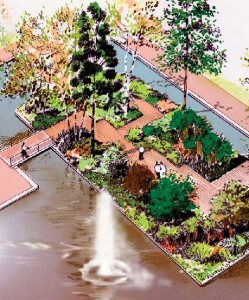 Barnes Walker Ltd have collaborated with Charlie Dimmock to design Jungle Island. 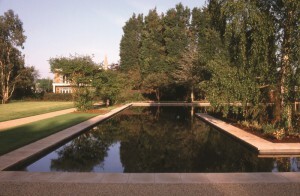 Barnes Walker have also been responsible for the masterplanning and detail design of the entire Festival Gardens and have designed and built the Formal Garden. Based in Manchester, Barnes Walker is a highly respected landscape design consultancy offering a full range of landscape services.